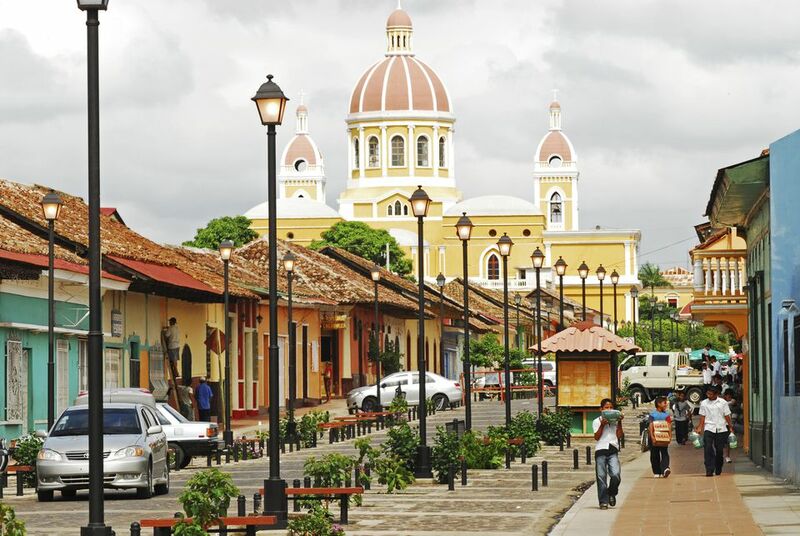 Nicaragua, the largest country in Central America, is bordered by Costa Rica to the south and Honduras to the north. About the size of Alabama, the scenic country has colonial cities, volcanoes, lakes, rainforests, and beaches. Known for its rich biodiversity, the country attracts more than one million tourists annually; tourism is the country's second-largest industry after agriculture. Christopher Columbus explored the Caribbean coast of Nicaragua during his fourth and final voyage to the Americas. In the mid-1800s, an American doctor and mercenary named William Walker took a military expedition to Nicaragua and declared himself the president. His rule lasted only one year, after which he was defeated by a coalition of Central American armies and executed by the Honduran government. In his short time in Nicaragua, Walker managed to do plenty of damage, however; Colonial relics in Granada still bear scorch marks from his retreat, when his troops set the city ablaze. Nicaragua’s coastline abuts the Pacific Ocean on the west and the Caribbean Sea on its eastern shore. The waves of San Juan del Sur are ranked as some of the best for surfing in the world. The country boasts the two largest lakes in Central America: Lake Managua and Lake Nicaragua, the second-largest lake in the Americas after Peru's Lake Titicaca. It is home to the Lake Nicaragua shark, the world's only freshwater shark, which had mystified scientists for decades. Scientists realized in the 1960s that Lake Nicaragua sharks, originally thought to be an endemic species, were bull sharks who leaped the San Juan River rapids inland from the Caribbean Sea. Ometepe, an island formed by twin volcanoes in Lake Nicaragua, is the largest volcanic island in a freshwater lake in the world. Concepción, a majestic cone-shaped active volcano looms over the northern half of Ometepe, while the extinct volcano Maderas dominates the southern half. There are forty volcanoes in Nicaragua, a number of which are still active. Although the country's history of volcanic activity has resulted in lush vegetation and high-quality soil for agriculture, volcanic eruptions and earthquakes in the past have caused severe damage to areas of the country, including Managua. There are two UNESCO World Heritage Sites in Nicaragua: the León Cathedral, which is the largest cathedral in Central America, and the ruins of León Viejo, built in 1524 and abandoned in 1610 in fears of the nearby volcano Momotombo erupting. The southwest shore of Lake Nicaragua is just 15 miles from the Pacific Ocean at its shortest point. In the early 1900s, plans were made to create the Nicaragua Canal through the Isthmus of Rivas in order to link the Caribbean Sea with the Pacific Ocean. Instead, the Panama Canal was built. However, plans to create the Nicaragua Canal are still under consideration. Poverty is still a serious problem in Nicaragua, which is the poorest country in Central America and the second-poorest country in the Western Hemisphere after Haiti. With a population of about 6 million, close to half live in rural areas, and 25 percent live in the crowded capital, Managua. According to the Human Development Index, in 2012, Nicaragua's per-capita income was approximately $2,430, and 48 percent of the country's population lived below the poverty line. But the country's economy has been improving steadily since 2011, with an increase of 4.5 percent in the gross domestic product per capita index in 2015 alone. Nicaragua is the first country in the Americas to adopt polymer banknotes for its currency, the Nicaraguan Cordoba. Behind the scenes at one of Europe's best airports.